Sure, this cheese dip is cool and creamy. 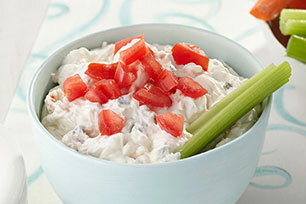 But this appetizer dip is also quick, tasty and versatile. Even better - our Cool & Creamy Vegetable Dip is also a HEALTHY LIVING recipe! Serve with cut-up fresh vegetables, Christie Wheat Thins Crackers or Triscuit Thin Crisps Crackers. Mix dip ingredients as directed. Do not top with tomatoes. Refrigerate up to 24 hours. Top with tomatoes just before serving.